Google will stop taking photography in Germany for Google Street View despite a court ruling declaring the service legal. Google's street-level mapping service, Street View, faced criticism over privacy concerns, leading to investigations and lawsuits in several European countries. A Berlin court ruling in March 2011 declared Street View legal in Germany, but a Google spokesman confirmed the company still has "no plans to launch new imagery on Street View in Germany at this stage". "Our user priority is to use our Google cars to collect data such as street names and road signs to improve our basic maps for our users in a similar way that other mapping companies do. 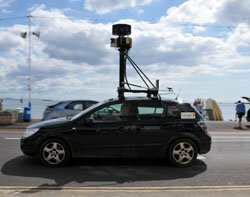 Of course, people who enjoy the benefits of Street View will still be able to access imagery from the 20 German cities that we have already launched and in 26 other countries around the world," the spokesman added. In May 2010, German prosecutors began a criminal probe into whether Google broke any laws when its mobile units collected private Wi-Fi data while recording images for Google Street View. By September 2010, the German government was calling for internet companies to draw up a data protection code following security concerns over Google Street View. Google has faced criticism from other European countries. The Swiss Federal Administrative Court ruled on 4 April 2011 that Google must blur its Street View images of people's faces.